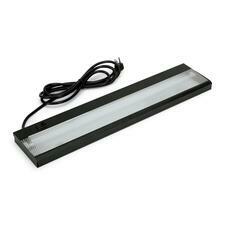 Elongated 36-piece LED strip lamp provides wide light dispersion. Adjustable shade rotation to focus light where needed. Classic pull chain for easy on/off power. 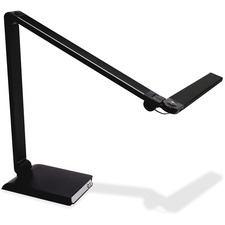 Lamp rotates 360° in clamp for maximum flexibility at work station. Smart touch switch has three-level dimming and auto shut-off functionality. All aluminum construction with a graphite gray finish. Three-way rotary switch accommodates three-way style bulbs. Includes tension knobs to lock arm and shade in working position. Shade mounted handle for easy adjustment of magnifier lens. Contemporary dome-shade styling in a matte black finish. Classic shade styling in matte black finish. All metal construction for maximum durability. USB charging port hidden on base for conveniently charging smart phones, tablets and other devices. Mounts with ease with steel spring clips. Vented shade allows heat to escape to help maintain comfortable work environment. Multi-directional shade and 25" arm. Includes base for desk and edge clamp for tables up to 2 1/4" thick. Energy-efficient bulb has 10,000-hour life rating.